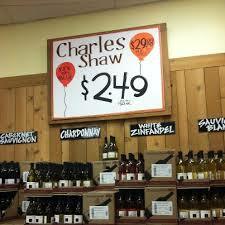 Charles Shaw wine, aka “Two Buck Chuck,” is one of the best-selling products ever sold at Trader Joe’s, topping 800 million bottles in 12 years. Now the man behind the brand is seeing red, and it has nothing to do with cabernet sauvignon. A blog suggested that Two Buck Chuck is inexpensive for several unflattering reasons, including large-scale machine harvesting, which ends up throwing everything into the wine, including animal blood. “You just wonder what other propaganda gets put in the press that you don’t know the real facts about,” said Fred Franzia, CEO of Bronco Wine Company, which makes and sells Charles Shaw wines. The “propaganda” Franzia refers to is a blog by a writer named Chris Knox that showed up on The Huffington Post last week.